WASHINGTON (CNS) — Many will make sacrifices to attend the upcoming World Youth Day in Panama in late January, but few compare to the challenges facing young Catholics in nearby Nicaragua as the country deals with political and economic upheaval, some of it involving violent clashes with government forces that have plagued the Central American nation since last year. 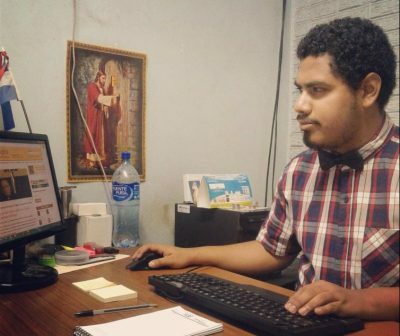 “Some of the young Nicaraguans heading to (World Youth Day) have made extraordinary economic sacrifices, selling things, begging institutions for help, because it’s a unique opportunity,” said Israel Gonzalez Espinoza, a Nicaraguan journalist for Religion Digital, a Spanish-language online news site that focuses on the Catholic Church. The Jan. 22-27 gathering in Panama City will be the first time the event, first instituted by St. John Paul II in 1985, will be held in Central America and likely the only opportunity for many of the region’s young adults and teens to catch a glimpse of Pope Francis, who arrives in Panama Jan. 23. The situation became worse when hundreds of protesters died in the clashes against Ortega’s administration, which kept moving toward getting a tighter grip on political power in the country, curbing tourism and business interests and sending the economy into a tailspin. An economy that was growing instead quickly contracted. Inter Press Service news agency reported in September that “more than 900 million dollars have fled the financial system” in Nicaragua since the conflict started. Covering the crisis on the frontlines was Catholic journalist Gonzalez, a 25-year-old who has documented the particular role the Catholic Church has played in the drama, as the bishops’ conference sought to mediate an end to the clashes, which have sent the citizenry running for cover into the country’s Catholic churches and facilities. But because of it, Gonzalez has paid the price of being accused by government supporters of being an instigator and also a mouthpiece of Managua Auxiliary Bishop Silvio Baez, who has been highly critical of the government. “As a Nicaraguan journalist, it has been the most fruitful year but also a painful year,” he told CNS. “As a journalist, it’s a bit risky for me to attend World Youth Day, because I have to take with me my equipment, my camera, microphone, but the problem is not leaving Nicaragua, it’s coming back,” he said. Because of those fears and because of the country’s deteriorating economic and political situation, which will make it difficult for many of them to afford even the short trip, only a fraction of young Nicaraguans will make it to the event. Estimates put the Nicaraguan delegation at between 5,000 to 6,000, said Gonzalez, who plans to cover the historic gathering. Though he’s put his plans to open a business on hold for the moment, Gonzalez said he decided to “bet on the side of journalism” and continue to document the church’s role in Nicaraguan society, in seeking dialogue, peace and a democratic process in the country. It’s hard to gauge, at the moment, what, if any effect, the crisis will have on pilgrims from Central American nations such as El Salvador, Guatemala, Mexico, Honduras, traveling by land through Nicaragua. Gonzalez said he’s heard that Panama has been in talks with officials in the country to expedite a safe passage of pilgrims traveling through and returning through Nicaragua before and after World Youth Day. He said he still recommends groups traveling by land to contact their respective embassies in the country a week before making the trip to avoid delays or problems.